Stay in City Center.Budget Friendly Home Stay.Bangkok City Accommodation.Airport Link Hotels,Pratunam. Experiencing how the local lives and being impressed by the beauty of landscaped tropical gardens lie in the center of the accommodations, The Bangkokians is a brand new accommodation in Bangkok city downtown near Pratunam market. This garden home will make you experience how we as Bangkokian lives. Being Bangkokian can be experiential, though our way of life is intimate and respectful. Everyone becomes to be your family after knowing each other. In terms of its best location, it is situated in a little alley where you do not have to be worried about traffic noises from the busy main street of Ratchaprarop. The Bangkokians City Garden Home is also closed to Platinum Malls for thousands kind of clothes and Pantip plaza for technology and IT gadgets. Closed by is one of the biggest shopping malls in South East Asia, Central World, connected by a Sky Walk to Siam Paragon, the largest shopping mall in Asia. There are many malls closed around it such as MBK Shopping Mall, Siam Square and Siam Discovery. Then back to relax in calm and quiet atmosphere and enjoy your moment in our Bangkokians living place – The Bangkokians - a member of SERENATA Hotels & Resorts Group, Thailand . All offers are certainly budget friendly and you can enjoy our fine culinary at Bistro de Bangkok Restaurant at our sister hotel in Bangkok located approx 90 m away from us. 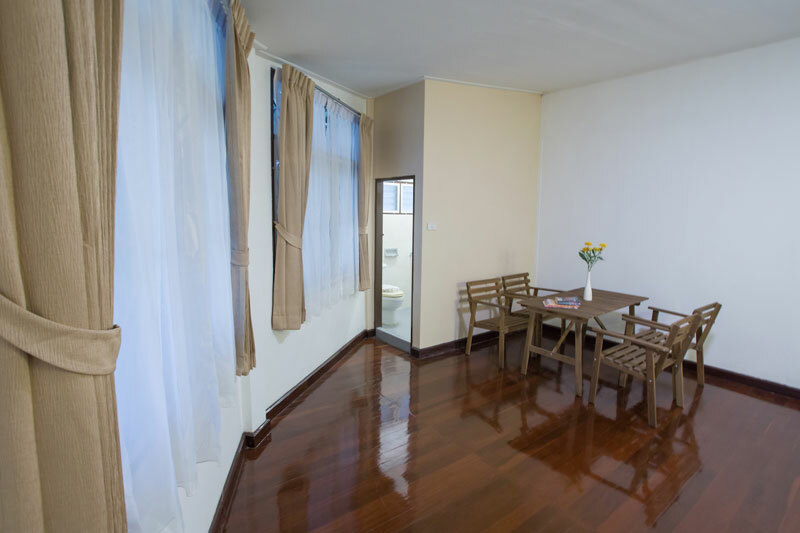 Conveniently located in the center of Bangkok city area close to Airport Rail Link (ARL Trains) and Pratunam local shopping street with only 5 min walking, The Bangkokians is therefore your great choice for everyone who wishes to visit touristic attractions and getting around the city, of course, at a budget accommodation rate offering.